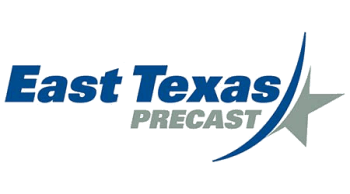 East Texas Precast, located in between Austin and Houston, Texas, is a PCI certified C4A plant that serves the state of Texas and western Louisiana. Founded in 1982 as a small structural precaster, East Texas Precast has continued to grow in size, production capacity, quality, and capability to provide architectural finishes. Similarly, in recent years, we have gone beyond being just parking garage experts and are now journeymen in control buildings, manufacturing facilities, and building shells. The current President/CEO, Randy Romani, has continued to elevate production capacities, community/client relationships, and employee satisfaction in his tenure. We attribute our success to our small business values; fair and competitive pricing, direct communication, meeting schedules, and giving back to our community. Although our business has changed in our 32 years of operation we still believe that direct, consistent, face-to-face communication will help our clients achieve their goals in the most efficient way possible. Most importantly, we make it a top priority to meet or beat our schedule. But completing a quality project on time isn’t enough for us. It is also important for us to give back to our community. For us, success is all about the relationships we have built with others. Giving back to the organizations that have helped us as well as charities and local events is just another way we show the respect we have for those who have made us successful. All of this wouldn’t be possible without the help of our 250 employees that ensure every piece is manufactured to the highest level of quality. With over 35 years of experience, Randy Romani began working in precast as a teenager with his father, Angelo. Throughout his career, he has been employed in all facets of a precast operation including; Erection Foreman, Sales Manager, Director of Sales and Marketing, Plant Manager, and President/CEO. He has also been committed to the evolution of the precast industry through his involvement in PCI. He currently serves on the marketing board and is the chair of the quality assurance committee. Most notably, he assisted in developing the first Total Precast Committee for PCI. During his tenure at East Texas Precast, his experience has provided innovative increases in daily production and product quality. Our youngest senior staff member, Chris comes to us with a strong educational background and experience in marketing for large organizations. He has immediately started to expand our client base and repair relationships with previously lost clients. He also has been dedicated to building relationships both between East Texas Precast’s employees and in the community through charity involvement. Finally, he has completly overhauled East Texas Precast’s marketing strategy. This has included developing new marketing materials and beginning to develop a social media presence. You can follow us on Linked-In and Facebook. Chris has also become increasingly involved with PCI He is a member of two marketing committees, website and marketing awareness committee. He has also recently been selected as the chair of the Energy and Industrial Taskforce. Vanessa received her Master’s degree in organizational development and leadership and then began a career in human resources starting in insurance. She began working for East Texas Precast in 2013 after almost a decade of experience in human resources. She is passionate about mentoring employees so that they can achieve their maximum potential. Her expertise includes coaching, organizational development, and employee relationships.